From bomb defusing to car soccer, one YouTube creator was ready to throw fans into their favorite video games with a new YouTube Red Originals series that had a virtual reality component. Alexis Cox of Google's Art, Copy & Code project helped design ways to invite users in. How do you get someone who has never experienced virtual reality to pick up a Google Cardboard or put on a headset? Maybe you don't—at least not immediately. Yes, VR is being heralded as the next frontier in advertising, marketing, and storytelling. 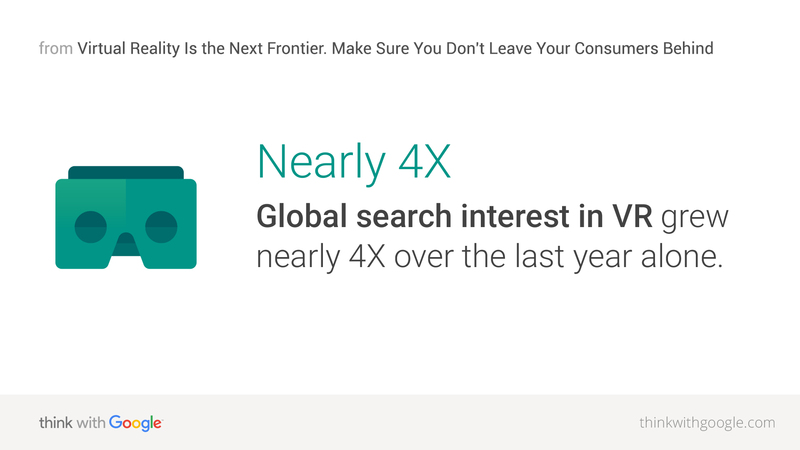 We know global search interest in VR grew nearly 4X over the last year alone.1 But we also know there are still large portions of the population that have never tried it. Many are curious and just need the opportunity, but others may be intimidated. Maybe it's time to stop simply telling people how much they need to try VR and start finding ways to make it easier to experience. With that in mind, Google's Art, Copy & Code teamed up with YouTube creator Matthew Patrick—known to fans as MatPat—earlier this year, just as he was poised to launch and promote his new YouTube Red Originals series. MatPat wanted to drive more fans to Game Lab 360, where he and his friends simulate the feeling of being inside video games. The series has two components: regular videos, which anyone with YouTube Red can watch on any device, and immersive VR companion pieces, which give fans a chance to experience first-hand what MatPat did in each episode. With a Google Cardboard, fans could come along for ostrich jousting, car soccer, and bomb defusing. The content was best experienced in VR using a headset, but we wanted to make it accessible to more people. "I was thrilled to have the opportunity to experiment more with storytelling in VR and introduce this new medium to my fans," MatPat said. "It seemed like such an incredible way to bring them along for the journey of the series. But we also knew many of my viewers had never tried it." To market the series, the teams sought to give viewers a taste of what was in store with Game Lab 360 and worked together to identify best practices for VR marketing. "We wanted to educate users about the many ways they can experience VR and to show why the content is so unique," said Jessica Sapick, brand marketing manager for YouTube Red Originals. To bring as many people into the experience as possible, we wanted to create different ways for fans to experience the VR companion content. Yes, VR is an immersive medium, but we didn't want putting on a headset to be a requirement. Here are four ways we eased fans into VR experiences, along with recommendations for marketers looking to do the same. To introduce experiences that welcomed fans, no matter their familiarity with VR, the team created multiple ways for fans to interact with the content. There were clear instructions and choices for users at every stage, on every device. 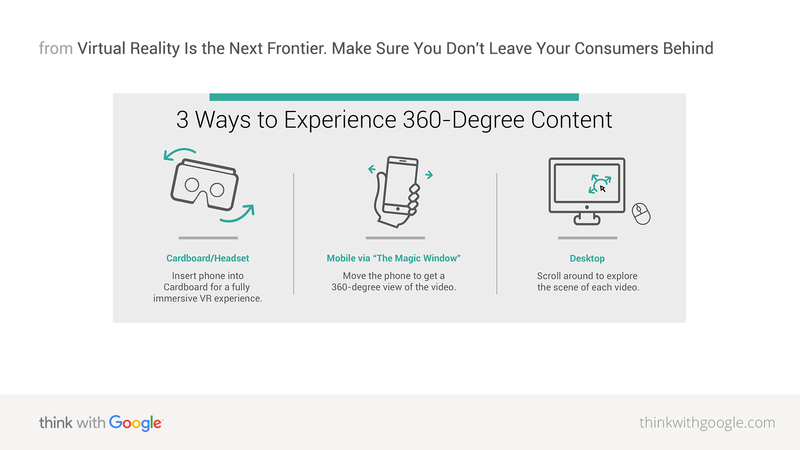 Through the content, fans could explore the 360-degree image on a desktop with their mouse, by moving around a mobile phone or tablet, or by using a smartphone with a Google Cardboard. That allowed them to easily look around a room or outdoor scene. It's critical to place clear instructions at every turn: in website copy, in the content itself, even in the voiceover of a video. Think of it as a guided tour that will serve to educate rather than alienate new users. The 360 trailer we created shows MatPat speaking directly to viewers and guiding them through the experience. "If you're on your desktop take your mouse and scroll it around the screen," he explains before going on to describe how to access the experience using a mobile phone or Google Cardboard. "We had people averaging more than two minutes using their phones to explore certain 360 scenes," MatPat said. "That's really extraordinary. It shows they weren't just looking around a room, but exploring a world." We're all turning to our phones more and more. Over 60% of YouTube's views come from mobile,3 and we know that time spent watching videos on mobile has been increasing steadily the past few years. To give mobile users a simple way to participate after viewing the video trailer, we used immersive 360 images, with voice-over narration from MatPat who walked viewers through each scene. All they had to do was move their phones to simulate the feeling of looking around a room or exploring an outdoor scene. There were new things to see everywhere they looked, including up at the sky and down at the ground. This view is sometimes referred to as the "magic window." Users spent as much time engaging with the 360 images as the 360 video episode teasers. That showed that in addition to being a positive way to introduce users to immersive video experiences, 360 images are an effective format on their own. As we push into the future with Cardboard and—soon—Daydream-enabled VR experiences that let you enter a world via mobile, it's important not to forget the oldest digital platform: desktop. The majority of visitors to the Game Lab site interacted with the 360 content we created on their desktop, giving them a taste of what a VR experience might be like and delighting those fans. "When I realized that I could control the way the screen moved, my mouth dropped open," said one commenter on the site. By bringing a fresh, new experience to a more traditional platform, like desktop, you can keep viewers engaged with your content. The best campaigns invite people in with simple, compelling, and engaging experiences that are easy to access and enjoy on multiple platforms. Virtual reality has the potential to bring audiences into another world, to let them interact with a brand or an idea in a whole new way. But like any emerging technology, it presents challenges. Marketers using VR should develop experiences that are welcoming, both to VR pros and to those who might be new to the technology. By putting the user experience first, marketers can overcome the hurdles of any new technology to expand and delight their audiences. 1 Google Data, Global, May 2016. 2 Many experiences commonly referred to as Virtual Reality are also referred to as 360-degree 3-D or 360-degree stereoscopic. 3 YouTube Internal Data, Global, July 2016.